Anton Venter is an experiended freelance Dynamics AX developer and operates under the name AxConsultancy. 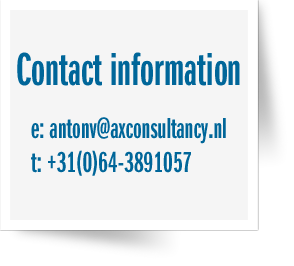 Anton provides high quality development and technical consultancy services for Microsoft Dynamics AX (formerly Axapta). With more than ten years of programming experience in different languages like C++, Java and Visual Basic, Anton has been working exclusively with Microsoft Dynamics AX since 2004.